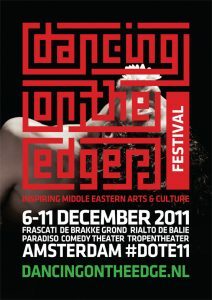 The third edition of the Dancing on the Edge Festival took place from 6 to 17 December 2011 in Amsterdam, Rotterdam, Utrecht, Groningen and The Hague. Artists from Egypt, Jordan, Iran, Iraq, Morocco, Tunisia, Israel, Palestine, Syria, Lebanon and the Netherlands participated. In addition to the dance and theater performances, the festival presented visual arts installations and a film program called Critical Syrian Cinema: Roots of Revolution? The Arts & Minds program included a broad variety of lectures, discussions, meetings, debates and workshops. Morocco Moves was the title of the cultural education program of 2011.